Pacific Ridge welcomed ten international students to the school community at the beginning of the year, and the group has quickly embraced the campus, engaged in classes, and formed new friendships with their classmates and with one another. On November 19th, the students got together for a pre-Thanksgiving dinner at a local Chinese restaurant to celebrate a successful first trimester. 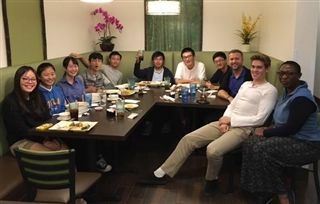 The nine Chinese students and one Austrian student meet monthly to connect and share experiences.